For various reasons, in all my years of collecting Pez (this is Xan writing this first person blog. Hiya. ), I’ve never been able to make it to the Pezamania convention. Since Pezamania is in Independence, Ohio (aka 15 minutes south of downtown Cleveland), getting to one of these conventions doesn’t seem like much of a feat, but something always happened to prevent my going. I started collecting around the same time I started college, so the traditional collegiate poverty prevented my going back in the mid 1990s. Yet after this passed, the Pez fates never seemed to be on my side. Wether it was not being able to get the time off of work, other events the same weekend, or the basement flooding, something always got in the way. I was determined to break this cycle this year. As soon as my office opened up the system to time off requests, I requested the weekend, and once I found I’d been approved started saving money. Nothing says buzz kill like being able to go to a Pez convention, but having it just be window shopping because you didn’t financially prepare. Chris reserved the hotel in February, and I registered both of us the same night so we could be registered guests and be part of the festivities. Nothing except possibly another monsoon in the basement was going to prevent this trip. Thankfully, the basement stayed dry and this year for Pezamania 19, I was finally able to attend. I wasn’t sure what to expect from a Pez convention. Would it be full of dealers selling only very rare and expensive dispensers, or people with just the most recent stuff? I was quite pleased to find that Pezamania is both, and everything in between. From the guy with the $.50 recent dispensers to author and well known collector David Welch’s ultra rare pieces (he had a Sparefroh with a coin, which in Pez language means $$$$$), this show ran the gamut. I was able to find vintage Pez, find pieces I was missing from newer series, and several foreign series. 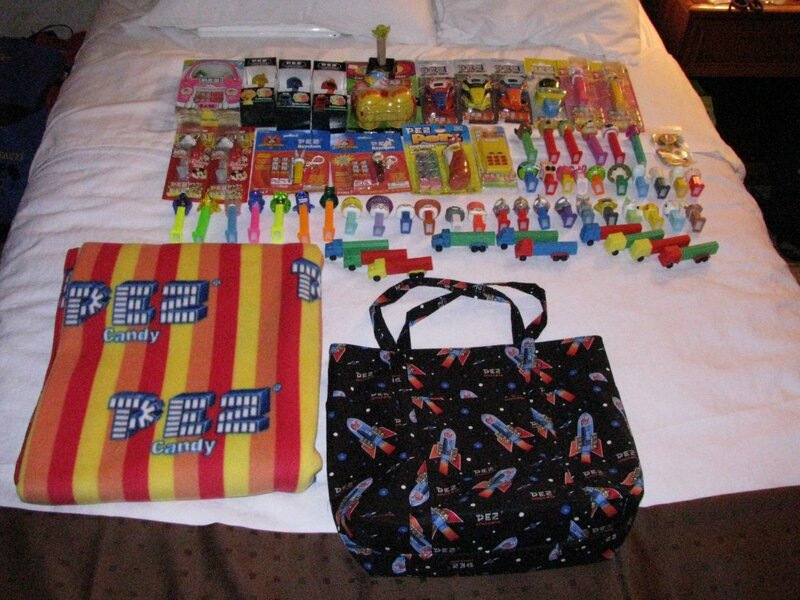 Not to mention all of the non dispenser Pez related stuff such as the 12″ plush and the 12″ coin banks. Oh, and handmade crafts from Pez fabric, like a very warm and cozy polar fleece Pez blanket and a handmade Pez tote. I went Pez insane. And I loved it. Going to this convention was as fun as my first Motor City Comic Con, which was my first comic convention. It was so much fun to be completely immersed in my hobby, and around people who understand this sickness that is obsessive Pez collecting. So often when I tell people I collect Pez, I get reactions like “They still make Pez?” Chris has gotten similar comments when he tells people he draws comic books, so he knows how much this feels like no one is interested in what I’m interested. I met so many very nice people, including Shawn Peterson and David Welch, who literally wrote the books on Pez collecting. My copy of Shawn Peterson’s book is all marked up and dog-eared from constant use and reference. Some of the dealers I met were so much fun, and so were the guests. The convention was quite different than other toy shows or comic conventions. According to the itinerary provided online by the convention organizers (who were fantastic people and very sweet), Wednesday began registration which continued until Friday, and Thursday and Friday included “Room Hopping”. At first I thought this meant that the convention wasn’t able to procure a large ballroom, but instead was able to get a few conference rooms. This was not the case. Room Hopping was literally, hopping from hotel room to hotel room. The dealers set up their Pez wares on the beds, desks, and windowsills of their hotel rooms, made signs for their doors which they propped open, and registered guests just hopped from room to room buying stuff. This was quite fun, and gave me a chance to meet and talk to a lot of neat people. 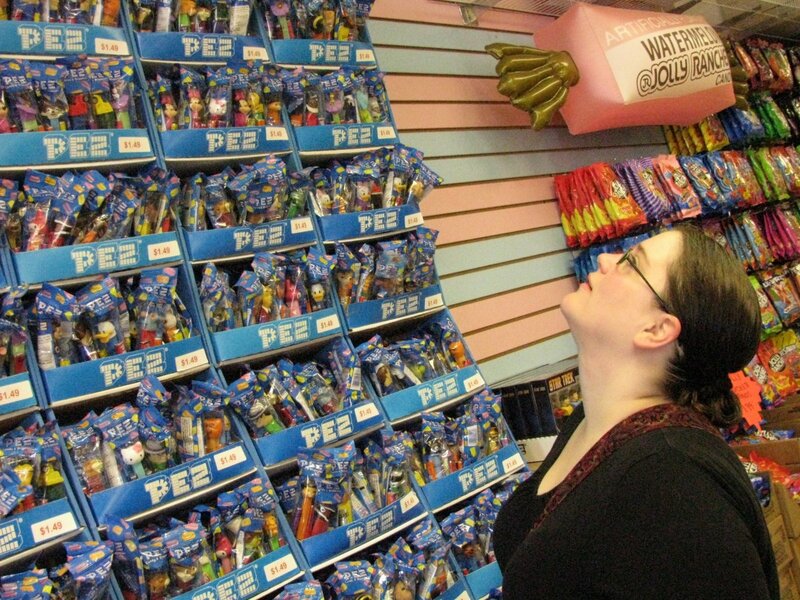 While it was a bit cramped in the rooms, Pez isn’t very large so even a single room could fit a lot of Pez to browse. And with rooms spread over 2 floors with a room or 2 peppered in on the 3rd and 4th floors, there was plenty to look at. By the end of room hopping on Thursday I was able to purchase exactly what I’d specifically wanted to get at this show and then some. Thursday began with Chris and I sleeping in (the most lovely and decadent way to start a vacation) and taking our time on the drive up to Cleveland. The show was at a Holiday Inn, so we checked in (if you can swing being in the same hotel as a convention, I highly recommend it), registered, and just went right up to our room to dump the luggage and check out the registration packets. Every convention has a convention exclusive Pez, pins and t-shirts, so I was anxious to check those out. This show even provided tote bags with registration, and this was incredibly handy. As soon as we were settled and the luggage was dropped off, I was ready to race down to the rooms for hopping. My first course of action was to find Red Conroy to whom I owed money from my last toy show Pez spree. I met Red at one of the Dayton Ohio toy shows held at Hara Arena, where he allowed me to owe him for some dispensers. Since I never write checks anymore I kept forgetting to send him the money I owed him, so I shamefully owed him longer than was polite. I knew he would be at this show, so this was the first thing I did. He was so sweet about it and hadn’t seemed to sweat it, so I gave him the money I owed, then gave him more money for some new stuff. He and I talked about the next Hara show, and I’m sure I’ll buy lots from him again. After Red’s room, I found myself in David Welch’s room since I could tell from the hallway that what he had on display was amazing. From him I was finally able to get the Little Orphan Annie dispenser I‘ve been wanting for quite some time, as well as an as close to pristine as possible soft head Wonder Woman. I was determined to find Annie, so it was great to find it so early. I kept hopping and hopping until my satchel was full of Pez and Chris had no more room in his backpack, at which time we went back to the room so I could grab my suitcase of duplicates to take to the swap party. I made some nice trades and was able to empty the suitcase a bit, which was great. Especially since I traded for some Giant Pez, and those are so expensive that I’m not always jumping to buy them new. After swapping was “Pezamania Wars”, which was a ballroom filled with people playing the card game War, and winner playing winner until last man standing. Chris and I split up and played other people so we’d have a better chance at winning something, but we were both eliminated the same round, which was the round BEFORE participant prizes were given. Of course. But we met nice people and had fun, so while prizes are always nice, not winning didn’t ruin the evening or anything. Now by this point Thursday, I had been so Pez crazed that I’d completely neglected to consider things like dinner and once I noticed this realized that I was starving. Chris was too, poor guy. He’s so sweet to just let me go nuts and starve him! Not much was around that was still open besides a Denny’s, but we were all about the Denny’s by this point. It was open and right across the street from the hotel, which meant it was perfect. Friday saw us once again sleeping in (the hotel room was so dark it was easy to stay in bed) and room hopping. Again, I was able to find a lot of stuff and meet fun people, and going back to the room to drop off stuff. There was another game event that night called “Diceamania”, but the previous night Chris and I met a very nice couple who told us that there was now a second Big Fun vintage toy store location in Lakewood, so we decided to check that out instead. Dicemania might have been something cool since the prizes were great, but I wasn’t feeling lucky, so we spent Friday night browsing Big Fun, then eating at IHOP. Saturday morning was the official show date, and all of the dealers had moved from their rooms to the ballroom, and the show opened to the public with just a door admission, no registration required. 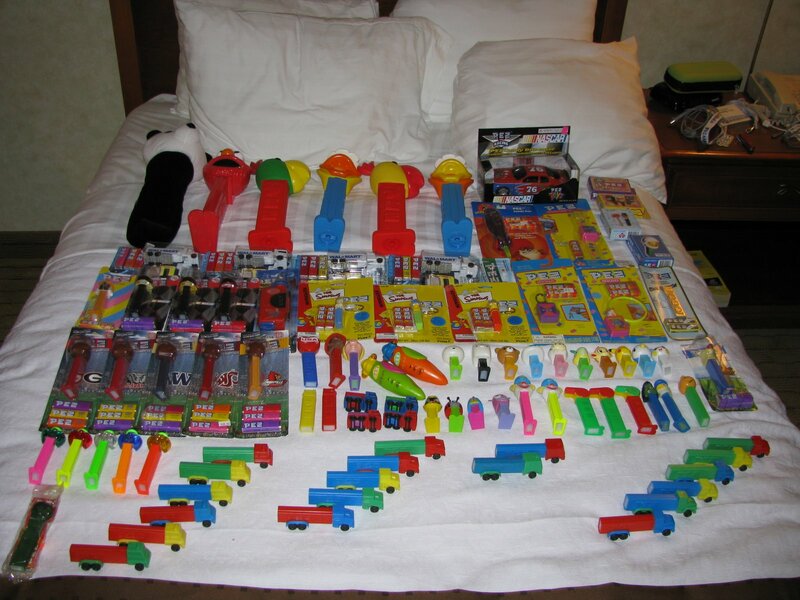 Now to see a hotel ballroom convention type setting with nothing but Pez (and the occasionally Klix for some ungodly reason) was like my Woodstock. Seriously, this was so cool. Chris was tired and had a migraine, so I went down without him intending to meet up with him later. But honestly, thanks to the room hopping, I’d seen most of the dealers so after one or two laps around the ballroom, I was done! This was the day I bought the fabric crafty stuff like my new Pez tote bag and Pez blanket which I love! It is so cozy! The show opened at 9:30 so since I had been up late the night before, once I was done browsing the ballroom at around 11, I was ready for a nap! I went back to the room where Chris was still sleeping and napped until it was time to go meet his family. Chris’ grandmother, uncle and aunt were passing through Ohio the same weekend as the Pez convention, so Saturday we drove back down to Mansfield to hang out with them for a bit and have dinner. Had we not had the hotel room until Sunday we would have just gone back home after visiting, but we went back to the Holiday Inn. This was nice as this meant we could spend some time in Cleveland on Sunday as well before seeing family again. Now, a little side note on this Holiday Inn. It was a nice hotel, but it had a cocktail lounge that was classic. Thursday night it featured a Chicago cover band (! ), Friday was what seemed like business people cutting loose and being inappropriately flirty, and Saturday was a class reunion, complete with alumni wearing leather pants and shiny shirts and dancing to 50 Cent’s “In Da Club”. Chris was pretty appalled that I knew the lyrics to that one. Okay, back to Sunday. Chris and I go to Cleveland a lot, but often it is for concerts and due to time constraints, we go for the show and nothing else. We also visit my family, so until this trip Chris had seen Highland Heights, Coventry Road, The House of Blues and the Beachland Ballroom. This trip we were able to do a lot of driving (Lakewood is west side, our hotel was east side, so we drove through the city and along the lake to get to Lakewood) and Chris was able to see more of the city. Of course, we still wanted to check out the Coventry Big Fun, since Chris wanted to check out their G.I. Joe section. Before we hit Big Fun, I wanted to check out a place that had provided little candy goodie bags for registered Pezamania guests. The place is called B.A. Sweetie, and it is a candy warehouse. It is in Brooklyn which is near Parma, and I’m not often in that part of Cleveland, so I’d never heard of this place and was excited to check it out. This place is a candy heaven. Granted, I’m 33 and as such, candy isn’t all I want to spend my money on anymore, but I have to admit, candy is still fun as hell. This place had all of my favorite Ferrera Pan candies as well as just about everything else sans chocolate that I love. 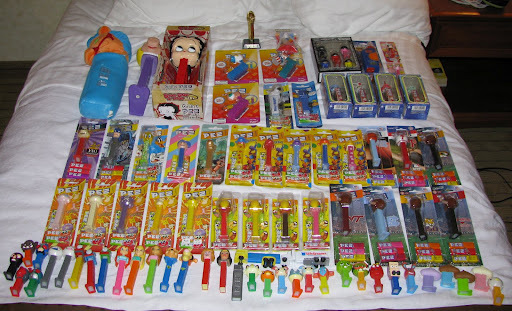 They also sell Pez, and even though what they sell is the current series (I’m caught up on what’s currently in production-as of the writing of this blog I am missing like 1 NASCAR helmet) I was still in awe of their wall of Pez. I think I’m going to make this place a stop on my tours of Cleveland when I go. Big Fun, IHOP, and now B.A. Sweetie. So that was our Pez filled vacation. I had a fantastic time, and it was so great that Chris was able to come with me. He’s not a Pez collector, but he found some stuff he thought was very cool, and even bought himself a flashlight in the shape of the psychedelic hand dispenser that he hooked to his backpack. I am going to try to make sure I can make it next year too. After my haul from this conve ntion, my collection total is now around 960, so I now can’t wait to break 1000. If the new series coming out this year don’t get me there, Pezamania 20 surely will! If you’re interested in more details regarding the basement flood, let me know. It was the 2nd basement flood Chris and I have dealt with since we’ve been married, and it was not the last. Nice Totoro dispenser! Would love to get one of each Ghibli character!